HWPL, the Strong Peace Wind: Peace Festival, IPYG Card Section "War and Peace"
"What really made a strong impression was the larger picture - the teamwork, the humility, the attention to detail. 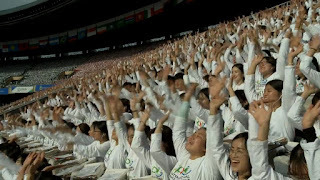 The work that HWPL is committed to requires that a tremendous amount of people become united by a single purpose and work together on such a level that has never been witnessed in the history of the world - peace. I would not trade the chance to see this performance for any other performance in the world." 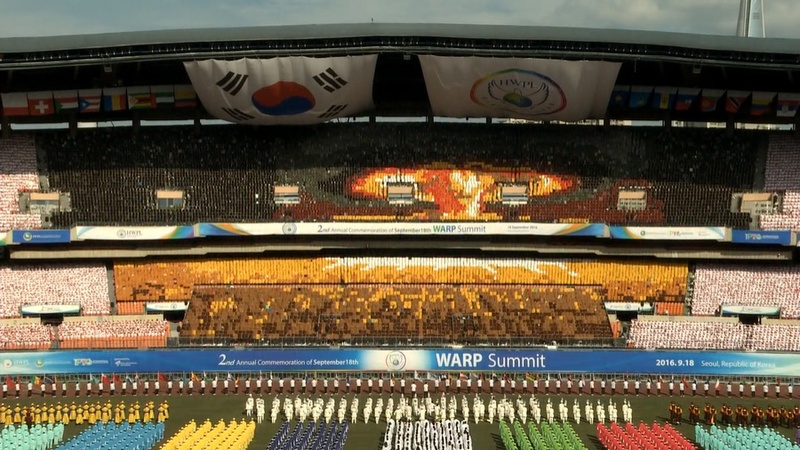 Global leaders around the world began to discuss action plans for advocacy and implementation of the Declaration of Peace and Cessation of War (DPCW) at the WARP Summit. 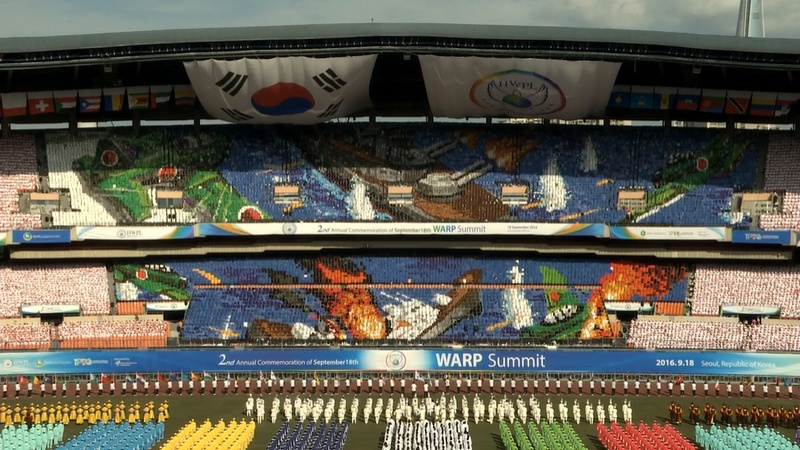 At the Peace Festival on the second day of the Summit, the IPYG Card Section Performance was displayed with the title "War and Peacethe eye-catching images made by 12,000 cards have been the symbol of HWPL's peace initiatives. A world of peace desired by humanity has been devastated by the roaring cries of war. Images created by the combination of each card from 12,000 youth illustrated the atrocities of war and loss of human value in the 20th century. Then what is needed to make this world a place where peace can prosper? Scene 2 and 3 offered a solution to our global community. The last century began with war and ended with war. Wars destroyed houses, schools and infrastructure, but, more seriously, the impact of violence on a daily basis resulted in the loss of human dignity. The fear from war ruled over the century and blurred out the possibility of peace. The two World Wars forced all people from earth to get involved in making this world a killing field. Advanced technology became mixed blessing, since it created fast and comfortable life style and killing style at the same time. The tyranny of war left a huge burden of responsibility to the future generations - us. 32,524,566 from WWI, 70,000,000 from WWII, and too many more after them lost their lives. The message "Do you think you are safe now that wars are over?" gave a strong impression. War is still in existence and the horrible destruction of life threatens our daily lives, as the cards showed another message - "We are still living at war." 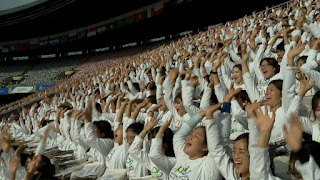 Peace activities initiated by HWPL are to overcome tragedy of war. The initiatives are 1) support from leaders of states by signing signatures, 2) participation of youth and women in peace-building projects, 3) delivering messages of peace through media. With the support, advice and cooperation from specialists on international law, the Declaration of Peace and Cessation of War was drafted and proclaimed on March 14th, 2016. Commitment of global cooperation and support at the WARP Summit 2016 will be a cornerstone of establishment of international legal foundation for peace. 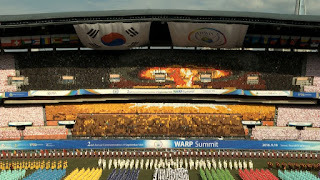 A world peace, desired by the global citizens, will see the process of development and achievement through the unification of the two divided Koreas, one of the most dangerous areas of conflict. Cessation of war in the Korean Peninsula began with youth soldiers putting down their guns against each other. Peace talks will be the sign of peace and the light of change will shine as a legacy for future generations. Amidst a backdrop of wars and conflicts that we see in news and pictures, and many first-hand, it's hard to imagine sometimes that our lives will ever become one built on a culture of peace. But the performance by the members of IPYG has no doubt given that hope to all of its viewers. For that, we can feel extremely grateful.